Left on her own, and armed with only her cunning and her famed Inazuma blade, Mariko must work outside the system to stop a terrorist mastermind. But going rogue draws the attention of an underground syndicate known as the Wind. For centuries they have controlled Japanese politics from the shadows, using mystical relics to achieve their nefarious ends - relics like Mariko's own sword and the iron demon mask whose evil curse is bound to the blade. Now the Wind is set on acquiring Mariko. Mariko is left with a perilous choice: Join an illicit insurgency to thwart a deadly villain or remain true to the law. Either way she cannot escape her sword’s curse. As sure as the blade will bring her to victory, it also promises to destroy her. ©2015 Steve Bein (P)2015 Audible Inc. I was waiting for this 3rd book in the series for months. It did not disappoint. Steve Bein tells a really engrossing story and writes both action and reflection very well. Memorable characters, fast pace and a great flow. I love this series and I'm glad Audible jumped on it and had the audiobook timed exactly with the release of the physical book. I can't wait to read more about Mariko and Daigoro. Alison Hiroto is also the perfect narrator for this series. This book probably sees her at her best. She voices all the characters well, but her Mariko fits the character so well. Only criticism is that the cover artist seems to have forgotten that Mariko doesn't have a complete right fore-finger as at the time of this book. Would you listen to Disciple of the Wind again? Why? Probably. He really cranked up the anticipation and suspense in this book. There were points where I literally could not stop listening. 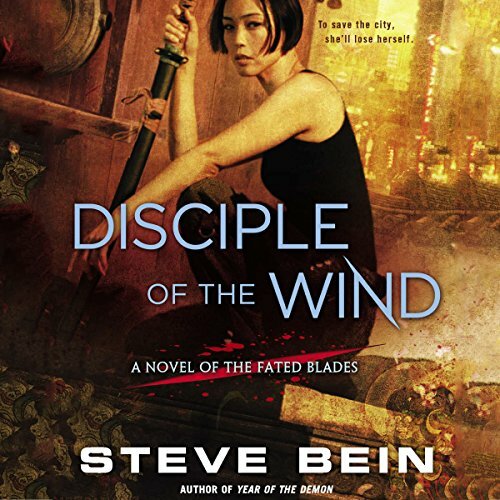 What other book might you compare Disciple of the Wind to and why? Lian Hearn. Similar historic settings and preternatural themes. Have you listened to any of Allison Hiroto’s other performances before? How does this one compare? Yes as she had read the other Fated Blades books. Same quality performance. Thumbs up. The historical scenes with Shichiryo and Okuma were particularly riveting, but Mariko for the first time held me in thrall as she pulled a John McLane hunting down a terrorist. Also her boss is a riot, "Frodo", HA! I would love to see another book that had more of him and Mariko's partner in it. Prof. Bein continues to write magical realism (but we don't call it that) for the 21st century crowd. Great action and relatable characters are marred only by a mostly predictable plot and a so-so performance by Ms. Hiroto, who is normally a more evocative narrator. I enjoyed the previous two books, but the third was a mistake! It was full of predictable storylines and pretty boring, struggled to finish this and feel like I really will return it! It adds nothing to the other books but a predictable long drawn out finish!